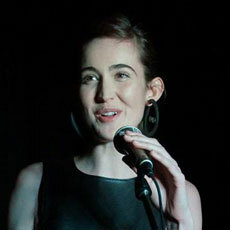 A.H. Cayley is a Sydney writer, broadcaster and performer. She is co-creator, senior producer and co-host of Backchat, FBi Radio's flagship politics programme, where she once convinced the former Deputy Prime Minister to forward-announce the UV Race song 'Raw Balls'. She curates and hosts Confession Booth at Giant Dwarf, is a writer and performer for A Rational Fear, and has been published in places like The Lifted Brow, Mess+Noise, Cuttings and PAN Magazine, where she was deputy editor. I was in an English class in Year 11 at Smith's Hill High School in Wollongong. My teacher, Mr Trickett, was one of those inspiring educators you'll tell your grandchildren about; I adored him. We were discussing equality and social structures and he said he was so deeply proud to have so many feminist women in his class. All the girls in the class looked around the room at each other, and it was obvious we'd all had a lightbulb moment, because none of us had identified with the word before. But there it was: a word for our system of beliefs! Feminism! Which apparently wasn't actually a bad thing! It was something to be proud of! It took a while still for me to fully embrace the term, but that was definitely where it started.